Is Dez Bryant worthy of carry the title of X-Factor? Is Drew Brees still the best QB in the NFC South? What challenges does Kansas City Chiefs rookie QB Patrick Mahomes face in his first career start? Read more to find out these answers and more in Bryant’s 3-for-3. 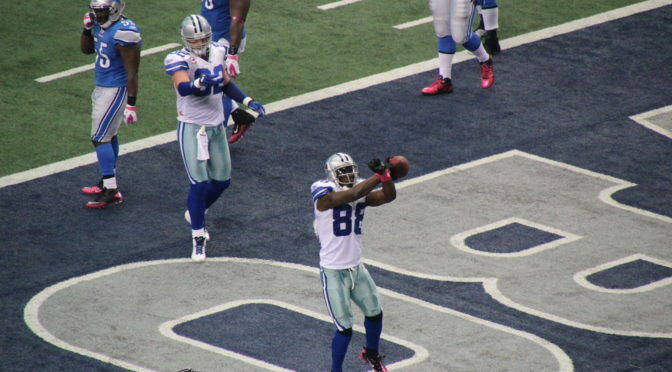 There’s no question from a physical standpoint Dez Bryant is one of those Terrell Owens specimen-type athletes. However, Bryant’s mediocre productivity this season has only been a reflection of his previous two seasons in Dallas. The Cowboys need more from their big money receiver. Before the double coverage murmurs begin, teams have had to respect the veteran presence of Jason Witten, the consistency of Cole Beasley, and the speed of Terrance Williams. Even when comparing him with Hall of Fame WR Michael Irvin in his eighth-year in the NFL, Irvin had 111 catches for over 1,600 yards (1995). Despite a decline in his numbers and less games played the following season, Irvin went on to have back-to-back 1,000-yard receiving seasons (1997-98). At this point, the projection of Bryant reaching his 2012-14 status is not looking so bright. In 2017, Bryant failed to have a 100-yard receiving game and according to Pro Football Focus, he ranks second in the NFL with nine drops. The bottom line is Bryant is underperforming his contract, as well as his lead position for the Cowboys organization. With the future at quarterback and running back, is it time for the Cowboys to seek a No. 1 WR in the 2018 NFL Draft? New Orleans Saints QB Drew Brees continues to find the Fountain of Youth. Over the last few seasons, the NFC South has been graced with the athleticism of Carolina Panthers QB Cam Newton, Atlanta Falcons 2016 MVP QB Matt Ryan, and the emerging Tampa Bay Buccaneers star Jameis Winston. However, the 38-year old veteran has led his team to its first winning record and playoff berth in four seasons. Perhaps these accomplishments are more fulfilling at this stage in his career than passing for 5,000 yards in a season (something he has accomplished four times). With one more game remaining on schedule, Brees has completed a career-high 71.9% of his passes and has managed to stay in the single digit column in interceptions (8). It has been eight years since Drew Brees has hoisted the Lombardi Trophy. Does the ageless wonder have what it takes to bring another championship back to New Orleans? After locking up the AFC West for the second season in a row and clinching a spot in the playoffs, head coach Andy Reid is turning the keys over to rookie QB Patrick Mahomes for Sunday’s contest against the Denver Broncos. While this game may serve as a meaningless game for some, Mahomes will still be tested by a Broncos defense that ranks second in the league in total defense and fourth in the league against the pass. Mahomes, the 10th overall pick in the 2017 draft, displayed great arm strength, strong hips through his release, and mobility coming out of Texas Tech. With a notable seasoned veteran and the potential contract discussions of Alex Smith at the end of the season, could we be getting a glimpse of the Chiefs new QB next season?